When we launched our cannabis survey in the early summer of 2018 we hoped that, despite the warm sun beckoning outside, people would take the time to tell us about their thoughts and experiences with this soon-to-be-legal substance. Well, residents of Wellington County, Dufferin County and the City of Guelph—thousands of you answered the call! Do you think folks are aware of the health risks (and if so, which risks)? What proportion think cannabis is a problem in their community? Do non-users plan to try it once it’s legal? Thank you to all who responded to the survey. We are always grateful to those who share their experiences with us, so we can learn more about health issues at the local level. We always post about the ways you can have your voice heard on our website. These key findings are about non-medical cannabis use in our community. Based on other Canadian cannabis surveys this number is expected to be between 15 and 22 percent, suggesting this survey attracted a high number of people who use cannabis-but not necessarily that more people use cannabis in our area. What do residents KNOW about cannabis? How do residents FEEL about cannabis? Did you know that the risks of using cannabis are higher for youth under age 25 than for adults over 25? About 38% of our survey respondents didn’t know. But young brains develop until that quarter-century mark, and that means cannabis affects young people differently. This is concerning because about half of respondents who had tried cannabis in the past said they tried it for the first time when they were 16 or younger. Find out more about how cannabis affects the developing brain. Why do these results matter? We wanted to get first-hand, local data so we can track the impact of cannabis legalization. From other substances (i.e., tobacco, alcohol) we know that increased access tends to result in greater use and greater harms. Will this be the case with cannabis? We’ll be able to compare future data with these baseline numbers to find out. 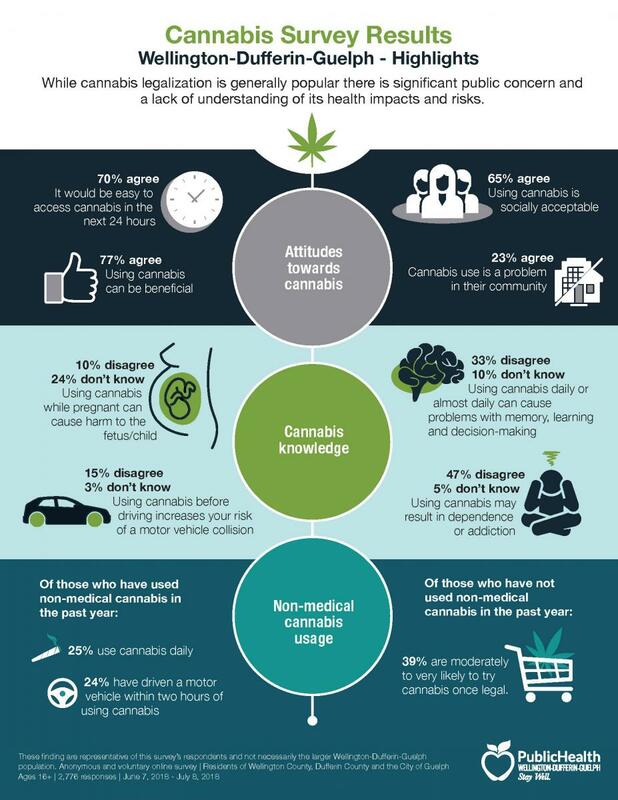 Results from this survey also helped us identify areas where we need to step up our education and information efforts so there is a lower chance of harm for those who do choose to use cannabis. Thanks for learning more about cannabis! Maybe you’re thinking of trying cannabis for the first time; maybe you work with pregnant women; or perhaps you have a teen (with a developing brain!) at home. In any case, we hope you learned something from these survey results. If you have any questions about the health effects of cannabis, we invite you to get in touch via our website, Facebook, Twitter or Instagram. If you have a pregnancy- or parenting-related question, call 1-800-265-7293 ext. 3616 to get advice from a public health nurse.